Find it hard to unwind and relax after a long day? Do you think it is way too much effort to go out in the cold and lift the cover of your spa? Have you ever wished that you had a magic key that could unlock a hot water paradise with just a turn? Well, let us give you the key to your own personal heaven in your backyard! 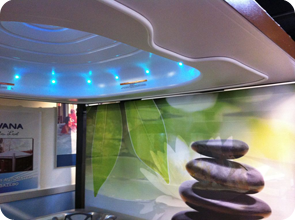 With Covana, you don’t need to lift the heavy covers when you wish to relax and unwind in your spa. Fully automated, ultra chic and super secure, the Covana is an all-in-one spa cover/gazebo extraordinaire that rises above and covers your spa with just a key stroke! The Covana is your personal key to the secluded refuge you have always dreamt of. With a relaxing ambience, convenient assembly and optimal design, the Covana ensures complete safety and enhanced privacy with professional precision. Now you have the liberty to lie down and relax in your spa whenever you want without a shard of hassle! 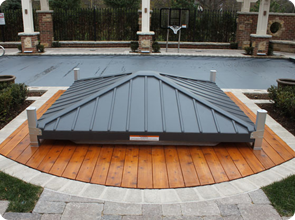 Also, keep your backyard child-friendly and secure with the Covana covering your hot tub throughout the day. As the Covana can only be accessed and unlocked through a key, this is the perfect accessory to make your backyard inviting for you and safe for your children! 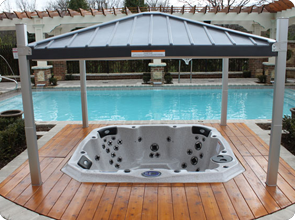 Leave for extended vacations without the worry of someone using your personal hot tub in your absence. The security lock feature of the Covana makes it ideal for family use. 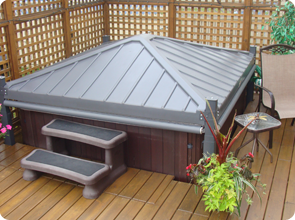 With so many features, exciting features and a convenient design to boot, the Covana is the perfect hot tub cover to ensure maximum privacy and security in your backyard. Get it now to make your backyard your very own automated spa sensation!